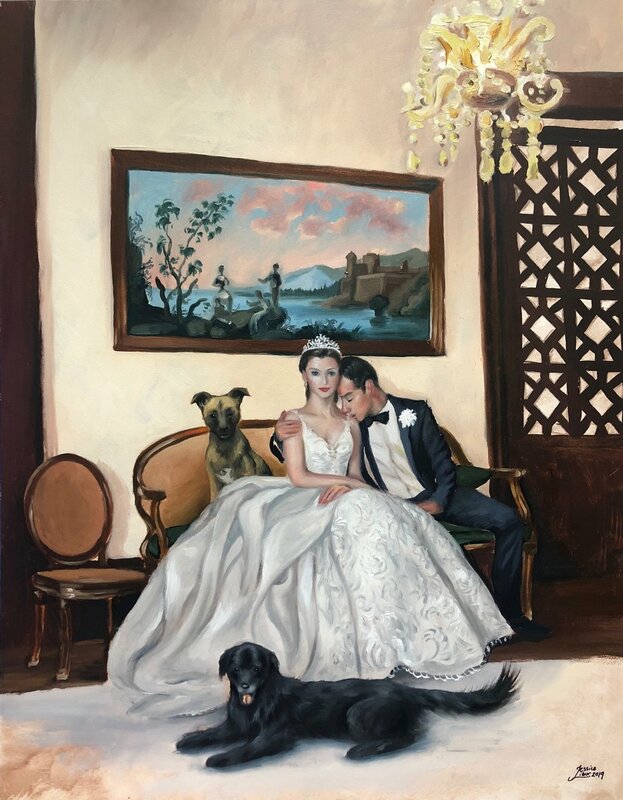 I work with clients to create meaningful commission paintings that are heirlooms for generations. If you are interested in commissioning a painting or drawing, please email me with your idea at jlibor@jessicalibor.com and I would be happy to give you an estimate and timeline! I work from photos, life, a combination, and also do live painting at events. “I commissioned Jessica to create a unique and special painting for my sister Kate’s 40th birthday. She is big on family and Game of Thrones, so I floated the idea to Jessica to paint “Kateleesi”—with my sister on the Iron Throne surrounded by her siblings. Jessica came back to me with a few drafts and we quickly hit on the perfect one. Not only did she complete the work in time for the surprise party, but she also hand-delivered it! My sister was moved to tears, and it added a cool-factor for her to meet the artist who painted her. This will hang in her home for decades to come and be a fun talking piece for visitors.” —Andrew R.